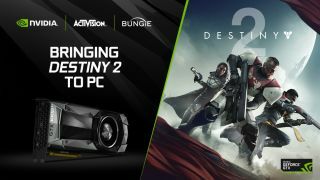 Nvidia has hooked up with Activision to push Destiny 2 for the PC, announcing that it will bundle the game with its high-end GeForce GTX 1080 and GTX 1080 Ti graphics cards. This offer runs until June 27, and those purchasing a GTX 1080 or 1080 Ti – or selected PCs or laptops running those GPUs – will get a free copy of Destiny 2 when it launches on PC in October, plus a further bonus in terms of gaining early access to the PC beta of the online shooter (which launches in August). The selected PC systems mentioned include Nvidia’s own GeForce GTX Battlebox range, which was recently refreshed to feature its newest Pascal-based graphics cards, and the likes of third-party vendors including CyberPower PC, Digital Storm, Maingear and Origin. Nvidia also promised that it will push out a game-ready driver for the PC beta test of Destiny 2, and another one for the official launch of the game, to ensure it runs as smoothly as possible on your rig. Furthermore, the company shared a fresh video which shows the shooter running at 4K resolution and 60 frames per second on the PC. It’s a short clip, but definitely an interesting watch – check it out above. It’s good to get some more upbeat Destiny 2 news, considering that yesterday we had the disappointing revelation that the PC version has been hampered by a longer delay than previously expected. While the console variants come out on September 6, PC gamers will have to wait until October 24 before they can join in the fun.